Hunter 59054 Eurus Ceiling Fan with Blades, Light Kit, and Remote - 54"
Home > Home Improvement > Fans > All Ceiling Fans > Hunter 59054 Eurus Ceiling Fan with Blades, Light Kit, and Remote - 54"
The Hunter Fan Company's sleek, modern and artistic Eurus Ceiling Fan is a piece of art that functions to cool your home. 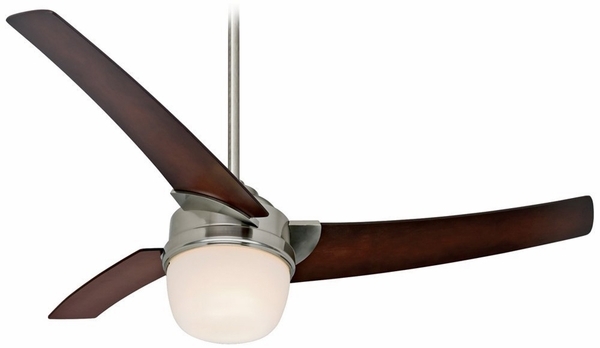 The Eurus 54 inch Ceiling Fan includes fan blades, a light kit, as well as a remote for convenient use. Finished in a lovely brushed nickel finish, the Eurus Ceiling Fan delivers clean, modern lines that are paired with gorgeous materials. The Eurus includes five Coffee Beech Veneer fan blades and a bowl light kit with a 5 inch downrod. The Eurus Ceiling Fan measures 11.5 inches from blade to ceiling, and 17.25 inches from ceiling to the bottom of the unit.